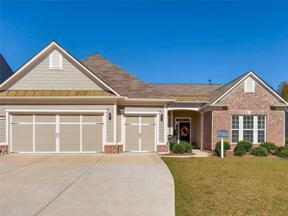 Stunning Dunwoody Way floor plan, 3 bedrooms PLUS an office, loaded with upgrades! 3 car garage, separate door for golf cart. Open floor plan, great for entertaining. Gourmet kitchen, large island, loaded with cabinets, granite countertops, stainless steel appliances, views the family room. Family room, cozy fireplace, build in shelves and cabinets. Loaded with gorgeous hardwood floors and storage. Covered porch plus extended patio. Award winning active adult 55+ community, huge clubhouse, indoor/outdoor pool, tennis & pickle ball, softball & 100 clubs to join.